As with many of the most important things in life, we often take our spinal cord health for granted. However, the moment we experience pain or suffer a spinal cord injury, we often realize that having a healthy spine is an essential part of a normal, active life. Our spines, made up of 24 stacked, bony vertebrae, must be flexible enough to allow us to move and bend without pain, but strong enough to withstand forces, including our body weight and the normal wear and tear of daily living. Not only does the spine need to protect the delicate spinal cord, it must give structure to our bodies, allowing us to walk upright, without weighing us down. The strong but flexible spine gives our muscles a strong place of attachment so they can move all our body parts with ease. Without our spines running vertically down the center of our bodies, much like the mast of a ship, we would not be able to carry ourselves through the world with ease and grace. 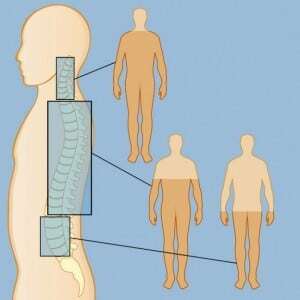 A fully functioning spine supports our ribcages, skulls, hips, shoulders, arms and legs. It’s quite a miracle of engineering when you stop to think about it! The bony spinal column is also specially designed to protect our delicate spinal cords, the bundle of nerve fibers which functions much like an information super highway for the body. Our spinal cord provides the critical link between mind and body, allowing our brains to receive sensory input from the outside world. If the spinal column is seriously damaged, the spinal cord may not be unable to transmit electrical impulses from the brain to another body part. This can result in pain, serious illness, loss of function and even death. When the spinal cord is damaged (e.g. in a fall or automobile accident), nerves can become compressed (nerve root compression) or permanently damaged, leaving the accident victim with partial or total loss of bodily functions, the inability to walk, perform the activities of daily life or even breathe on their own. For this reason, victims of spinal cord injuries are encouraged to seek legal counsel immediately after being involved in a car or other type of accident. An experienced personal injury attorney will be able to guide you and assess your legal options following an accident and spinal cord injury. The spine is compromised of three distinct segments: the cervical, thoracic and lumbar spine. Depending on where a spinal injury occurs, an accident victim will experience different levels of dysfunction (Understanding Levels of Injury). The cervical spine, or neck, is made of the first seven vertebrae of the spine (C1-C7). Injuries to the first four vertebrae (C1-C4) are usually considered the most severe spinal cord injuries (SCI), and may cause total paralysis in the arms, hands, trunk and legs, along with a reduced or severely impaired ability to breathe. Severe injuries to the C1-C4 vertebrae often cause tetraplegia or quadriplegia. In some cases, the ability to talk is also impaired. When the lower cervical nerves (C5-C8) are injured, patients may be able to speak, move and breathe normally but be unable to use their arms and/or hands. The twelve thoracic vertebrae (T1 –T12) connect to the bones in our ribcage. There are also five lumbar vertebrae (L1 – L5) in the lower back, along with the sacrum and coccyx bones (the spinal nerves exit these areas at levels called Foramen). When the T1-T5 vertebrae are injured, but have difficulty controlling trunk muscles (legs, trunk). Victims may be able to stand using braces and use their arms and hands. This type of injury is often referred to as paraplegia. When the T6-T12 thoracic vertebrae are injured, many patients retain the use of their hands but lose control of their bladder, bowel and sexual functions (trunk stability and function is affected). Depending on the level and severity of the injury, the patients may be able to stand using specialized braces and use manual wheelchairs. When the lumbar nerves (L1-L5) are injured, patients typically lose some use of their hips or legs, along with bladder and bowel control. Walking (with the aid of braces) is possible with this type of injury, but it depends on the severity of the injury. When the sacral nerves are injured, there is generally loss of bowel and bladder function, but patients are able to walk. However, this type of injury usually results in some impairment (loss of function) in the hips and legs. If you or a loved one sustained a spinal cord injury in an car accident, at work or as the result of another’s negligence, please contact the experienced personal injury attorneys at Hardy, Wolf and Downing to schedule a free and confidential evaluation of your case. Attorneys in our Lewiston, Portland and downtown Portland law offices are available to answer your questions and will put our expertise and experience in the field of personal injury law to work for your family. Our Maine personal injury attorneys provide our blog as a service to our clients. They are meant to be purely informational.